That’s what the strategy guide is for. Is it just me, or does that thing on the hallow Lord’s back look like the arc of the covenant? I bet he keeps a couple cold One’s in there ready for when they Watch Biblical Football Games. I know it’s still early after launch, but I wonder what DLC we’ll get. but I wonder what DLC we’ll get. The Crucible is first Darksiders 3 DLC we will get this month and next DLC, Keepers of the Void will be coming out next month or February 2019. Darksiders III: Keepers of the Void is the second DLC piece for Darksiders III . Here, Fury travels to the Serpent Holes to deal with an ancient threat. Most of the gameplay is based around puzzles , but there will be new enemies present to fight. THQ's Darksiders 3--coming to Xbox One, PS4, and PC--will get two post-launch DLC expansions, The Crucible and Keepers of the Void. You will get Fury’s Abyssal Armor if you beat Keepers of the Void. Her Abyssal Armor is an entirely new design, we might see what does Fury Abyssal Armor look like before second DLC coming out. 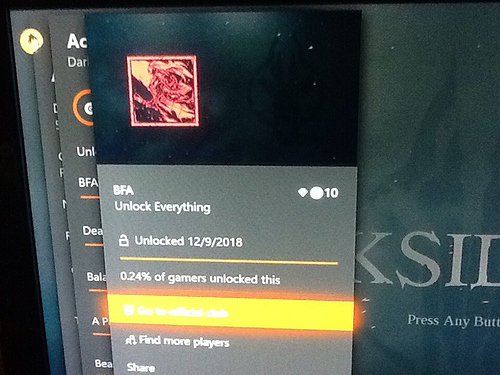 Oh one more thing… I unlocked whole Darksiders 3 achievements! First DS3 DLC is out today!